If this card is Normal Summoned: You can send 1 “Zoodiac” card from your Deck to the Graveyard. 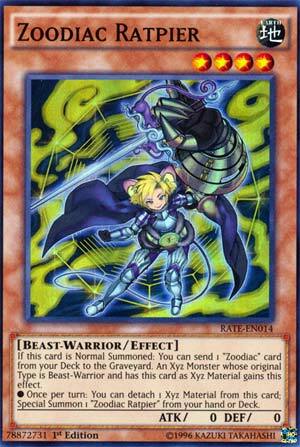 An Xyz Monster whose original Type is Beast-Warrior and has this card as Xyz Material gains this effect. ● Once per turn: You can detach 1 Xyz Material from this card; Special Summon 1 “Zoodiac Ratpier” from your hand or Deck. Our number #4 slot is from Raging Tempest, I promised the set would be mentioned again, and starts the degeneracy of the Zoodiac deck, Zoodiac Ratpier. Ratpier is a Level 4 Earth Beast-Warrior with 0 ATK and DEF. 0/0 is rarely ever good, the Level and Type makes it searchable by Tenki or summonable off M-X-Saber Invoker, both of which were popular in Zoodiac, Earth doesn’t offer much except for those old Grandsoil FTKs maybe. When Ratpier is Normal Summoned, you can send a Zoodiac card from the Deck to the GY. Common choices were Ramram, who could extend Zoodiac combos after the deck was hit, and Zoodiac Combo, which was Pot of Avarice basically. While Ratpier is the Xyz Material for a Beast-Warrior, which all the Zoodiac Xyzs are and they could of been summoned with one simple monster, you get the following effect as part of that Xyz monster: Once per turn, you can detatch a material from this card to Special Summon a Zoodiac Ratpier from the hand or deck. This card simply let Zoodiac abuse the Rank 4 engine to the max, and I find it crazy they even printed this. One of the most powerful cards I have ever seen, thankfully it is at one now, hopefully it stays there for a while.